On the 12th anniversary of the terroristic events of 9/11 Hawthorne unveiled its planned tribute of remembrance and honor to the men, women, and children killed in the terror attacks of September 11, 2001 and recognition of the efforts of those who responded in it's aftermath. The borough received a 24-foot beam from the World Trade Center in 2011. The beam is now placed in the memorial, located at 970 Goffle Road between the Hawthorne Volunteer Ambulance Corps building and Fire Rescue 5 headquarters. The memorial centered around the beam includes four granite monuments representing the public and the three branches of emergency services – police fire and ambulance corps. The memorial for Sal Zisa Jr., the only Hawthorne resident who perished in the 9/11 attacks, was also relocated to the new location with the steel beam. 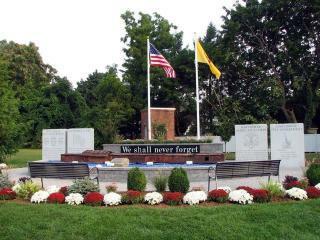 The four granite monuments were unveiled by the Hawthorne fire department, police department, ambulance corps and Ed McGuirk, a Hawthorne resident who escaped from one of the towers, to represent the public.